Yes, we use state of the art color matching technology. An actual computerized picture is taken of your vehicle's finish and our computer gives us the closest match possible. A deductible is your financial responsibility as it applies to the repair. If you are proven not at fault in the accident, then no deductible will apply(depending on your waiver coverage). If you are at fault in the accident or if their is no other party for the insurance to go after, then you are responsible for your deductible. Your deductible($500.00, $300.00 etc. )is your responsibility and is taken off of the final claim amount. Your deductible amount is determined when you buy your insurance. An example: The total repair amount written by the insurance company is$2200.00. If your deductible is $500.00, then you are responsible to pay the first $500.00 of damages to the repair shop and the insurance company is responsible for the remaining $1700.00. The insurance company will automatically deduct your deductible from their portion of the repair check. If no insurance is involved, then the deductible does not apply. If you are not deemed at fault in an accident and someone else is found at fault, then their insurance company is responsibility to provide you with a rental during your repairs. If you have rental on your own policy, then you can get a rental in any case, whether you are at fault or not. It is good to check with your agent about your rental coverage, it is inexpensive, but can be very helpful. If you have any questions on rentals, please call our office. When can I wash or wax my vehicle after the repair? As far as washing, you can do that at any time after the repair. As always, try to avoid a car wash that comes in direct contact with your vehicle's finish. You should wait between 5-6 weeks after the repair before waxing your vehicle. 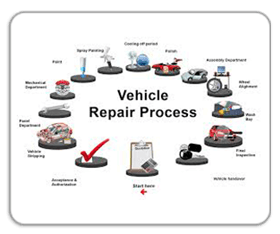 No, you are only required to get one estimate and you have the choice of where you want your vehicle repaired. It is your vehicle, you have the right to have it fixed where you feel comfortable. It depends on the extent of the repair and the availability of the insurance company if additional damage is found. My car is leased, do I have to have the dealer repair it? No, you have the right to have the registered repair facility of your choice repair the vehicle. What if more accident damage shows up after car is repaired? The repair shop will contact the insurance company and we will make sure, if the damage was accident related, that it will be quickly and thoroughly attended to and fixed. A supplement is the additional cost that is added to the original estimate. It consists of any increases in the prices of parts or damage that was found after the vehicle was taken apart. The original estimate is usually just a visual estimate. If the job is through insurance, the insurance company is responsible for all supplement damages minus any depreciation. A lien-holder is the bank or finance company that you financed your vehicle through. Usually, their name will be on your repair check along with your own name. (in the pay to the order of area of the check. )The lien-holder has to sign off on the check for the repairs and along with your signature we can accept that check. We can assist you in getting the lien-holder paperwork and getting the lien-holder to sign off. If you have any questions, please contact our office.